Our Super Easy Spicy Green Onion Dip recipe only takes 10 minutes to whip together, thus earning its name. Sour cream, garlic and cayenne pepper combine with the green onions for a ton of flavor. This is one of our family favorites, and probably our most made appetizer. Perfect for the big game coming up and other gatherings! Click here to jump down to the recipe. Updated this post in 2019 with our first Cooking Chat video! If this dip weren’t so good, my family would be pretty tired of it now. Seems like any time I need to bring an appetizer for an extended family gathering, I’m making this Super Easy Spicy Green Onion Dip. I made it again yesterday to share it for today’s #SundaySupper event focused on football food. This dip is so fast and easy to make, I can whip it up in 10 minutes, making it perfect for busy times. When visiting to watch a big game or celebrate a holiday, I often will quickly make this old standby, then bring something different along with it. The majority of my extended family and friends like some spice, so they are always quick to dive into the green onion dip when I set it out. 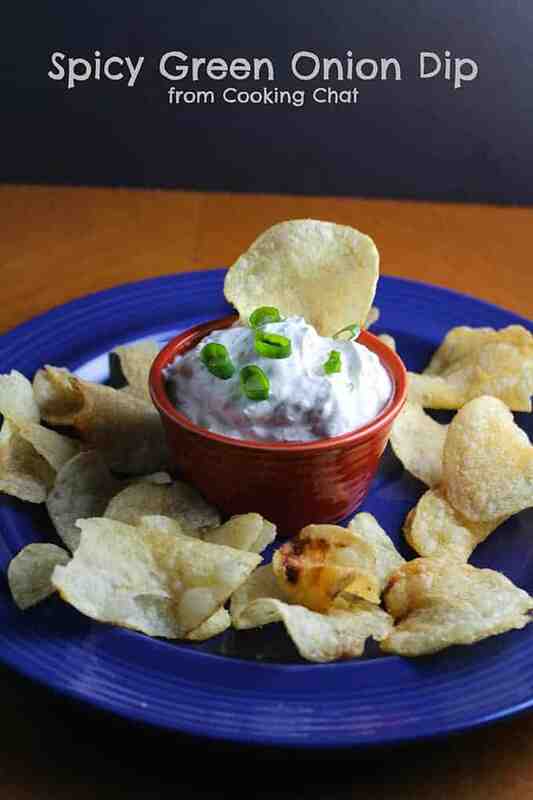 Just be sure to everyone has a beverage ready when they sample this spicy green onion dip! I’ll have some tips on what to pour in a minute. For Christmas, I’ve gotten in the habit of bringing this Spicy Red Pepper Dip along with the green onion dip. Other times, I might whip up something new. This Roasted Beet Dip with Fennel and Garlic is a new creation that was a big hit. I got the basic idea for this from a cookbook I have since misplaced. I’ve tweaked the recipe over time, and landed on this combination which seems to be just the right amount of spice for our tastes. You can experiment for yourself to see how much kick you want. The cayenne is the key variable that you can turn up or down slightly to change the heat. Give this Spicy Green Onion Dip a try soon (some nibbling while watching the big game next Sunday, perhaps? ), and I suspect it will soon be a regular part of your recipe rotation, too! As I said, you will definitely want to have a beverage ready when you sample the green onion dip! An IPA style beer is my go to option for something with a pretty good amount of spice like this. We have plenty of great IPAs made here in New England you can pour while you cheer on the 5 time champions! (sorry, couldn’t resist that plug!). If you do want to try wine with this dip, go with something with a bit of sweetness and spice, like a Gewürztraminer. Last night we enjoyed the spicy green onion dip with a glass of Moscato Giallo, a light Italian white wine with notes of white pepper, kiwi and honey. You could also try a sparkling wine, one that isn’t super dry. Another strategy I’ve employed with a glass of Pinot in hand at a party is to take a bite or two of our spicy dip, then have a bite of cheese or something mild before you go back to the wine. I’m going to call that a wine pairing #protip, keeping with the football theme! 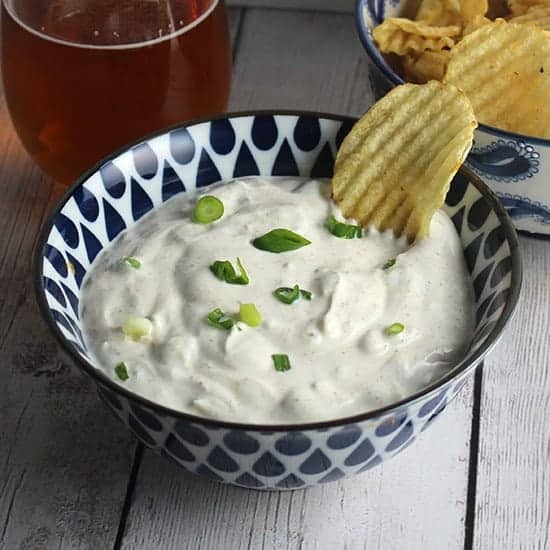 Spicy Green Onion Dip is simple to whip up for your next gathering, and is sure to please those that like a little spice! chips and/or raw vegetables for serving. 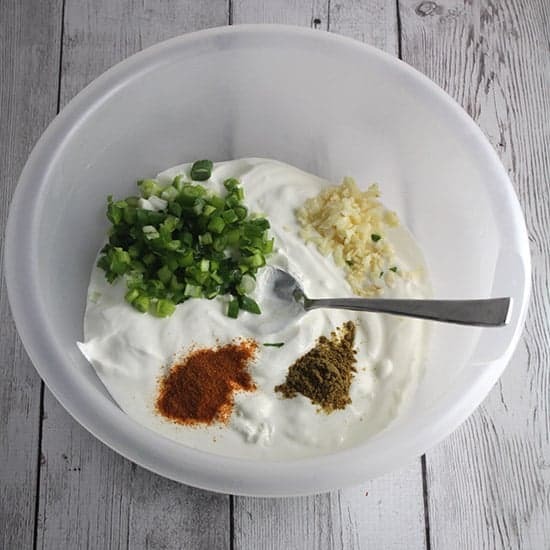 Combine all the ingredients from sour cream through cumin in a mixing bowl. Stir in the cayenne, making sure that it is thoroughly combined and spread throughout the dip. If you want to moderate the spice level, you could start by adding 1/4 teaspoon of cayenne and tasting the spice levels, then add a bit more if you want to kick up the spice. Serve the dip with potato chips for dipping, and make sure people have a drink ready when they start eating it! I recommend low fat sour cream to keep the calories down a bit. The flavor really comes from the garlic and spices, so I really don’t notice the difference using low fat sour cream. You can skip the cilantro if you don’t have it handy. I’ve made it without it a number of times, but if you like cilantro it is a nice addition. Adds some bright flavors to the dish. I usually serve the dish with potato chips but you could use raw veggies for a healthier options. Nutrition info is for the dip alone, doesn’t include the chips. Spicy??? Green onion dip. Ooooh man! I think my superbowl menu does need this. Thanks Kita, it’s tasty and easy. Thanks for stopping by! I absolutely love dips like this David! Any time all of those ingredients are involved, trust me, I am paying attention! This looks like the perfect thing for Super Bowl Sunday! Pinning! Thanks for stopping by & pinning! Yes, this would be an easy one to add to the Super Sunday mix! I do love a good spicy dip. This look like the perfect game day snack!!! Thanks Jocelyn! Very easy, too. Great looking dip. I have some fresh cilantro growing in a sunny window and it needs a trimming. I think it will go into this. Thanks for posting! Sure, thanks for stopping by, Wayne! I hadn’t thought about growing herbs inside, that’s a great idea. Yum! I love how easily this comes together! I can see why it is a family favorite. Love that this is simple yet full of flavor! Perfect for chip dipping during the game! David, I cannot wait to make this one! I love an onion dip and that touch of spice just makes my heart sing! Yum! thanks, it is a nice spicy flavor! I love the kick of cayenne in this! I definitely need to whip up a batch of this dip for our game days. I’m all about recipes with a kick! I can’t believe how easy this is to make. Can’t go wrong with chips and dip for game day! This looks so great- love the simple ingredients and heat factor! Dips just don´t get any better than this…I could eat this by the bowl!!! I just love easy dips like this! Love the flavors and cannot wait to try it!